​This is one of the reasons I keep coming back to Dumaguete—the best iced candy in the Philippines! So if you’ve been traveling back and forth to this “city of gentle people,” or if you’re one who happens to pass through this route on a basis more regular than just accidental, but then, you never cared to take a quick glance at this place, let alone make a quick stop over here, I’m afraid you’ve missed a half of your life. I had mine, mind you, but not until one day (quite a long time ago), when my niece Jenny Ann Pimentel suggested that I try this uniquely delicious iced candy sold like hot cakes at a convenience store located somewhere near Negros Oriental Provincial Hospital. And then I came to know that it’s called Mini Mart, across the Provincial Agriculturist Office which is just beside the hospital, beside Eterna Funeral Homes, in Daro, Dumaguete City. Since then, I’ve never skipped a chance to drop by and try as though it were my first each time. And whenever I’m here, I lick everything, all flavors—from mango float, to avocado, to buko, and to cookies & cream. Thirteen pesos for a thirteen-thousand-times more delicious iced candy than the usual won’t hurt, will it? David is a green-eyed showstopper with two nationalities: Swiss and French. On weekends he’s French; on weekdays he’s Swiss. His family lives in France, just a few minutes away to the Swiss border, specifically the City of Geneva, where he goes to school and prefers to settle down after finishing his Masters in Finance. 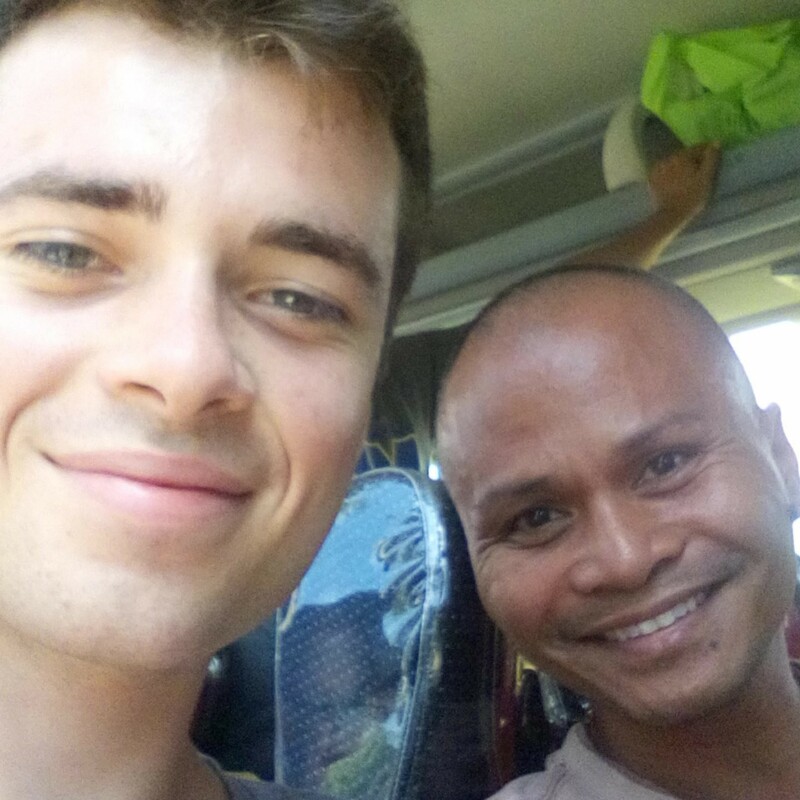 He’s been around the Philippines for six weeks already. His first destination was Davao, where he spent almost a month doing volunteer works, before taking heart and a risk going to Bohol despite having read the news. 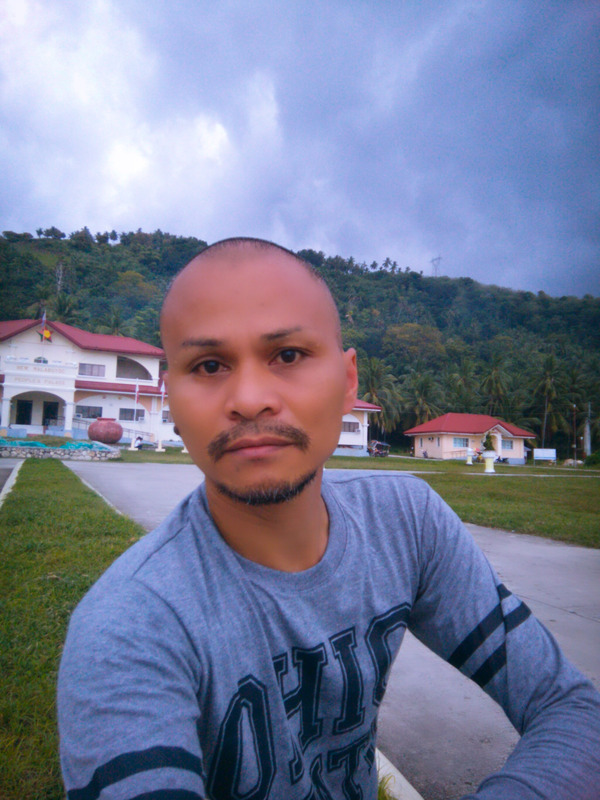 As of this writing, he’s basking on the beaches in Moalboal and is very excited to relish the same in Malapascua and Coron in the coming days, before heading north to Baguio, Sagada, and the Banaue Rice Terraces. At twenty-three, the math wizard almost lost count when I asked how many countries he’s visited. “Hmm, fifteen, maybe. But that’s because, in Europe, it’s easy to travel around and add every country on your list, considering that we’re just close to each other and relatively accessible to one another. As for coming here, I chose the Philippines because it’s the best country in Asia where I can practice and hone my English,” David explained. “I think your English is very good,” I told him. David took a one-year hiatus from graduating with his bachelor’s degree in finance June of last year to starting his masters come September. What he wants to do in the meantime is travel to where he can use English as much and as far as possible, in order to have gained more confidence by the time he enters the lobby of his university and walks into the classroom four months from now. 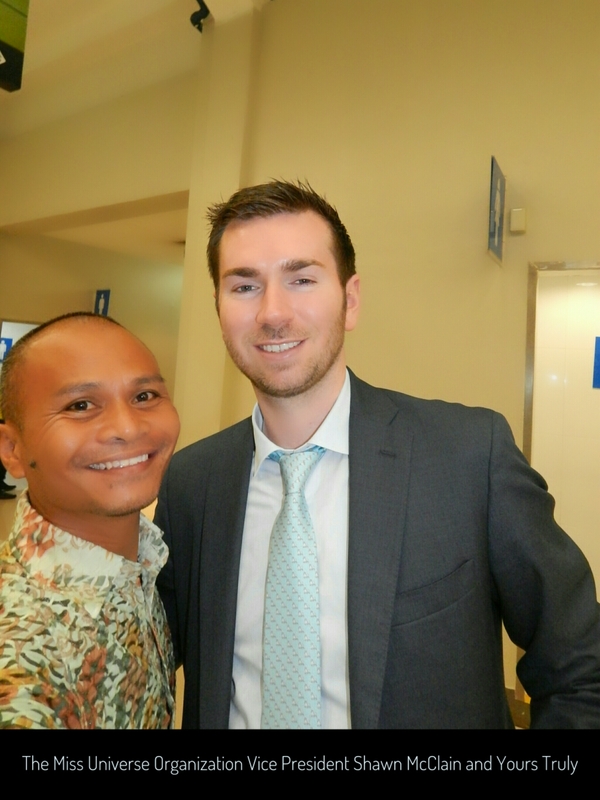 ​Attending my niece Jenny Ann Allera Pimentel’s graduation from the University of San Carlos’s School of Law and Governance the day prior may have perfectly overtured my encounter yesterday with this Spaniard from the city of Barcelona. That’s because this twenty-seven-year-old dead ringer for Ryan Agoncillo is a lawyer whose name is Alvaro Calderon. We chummed up right away at Liloan Port in Santander, Cebu, while I was waiting to board the fast craft bound for Dumaguete City in Negros Oriental through Sibulan Port. It’s interesting that Atty. Alvaro Calderon graduated from the law school in his native country, passed the bar examinations with flying colors, worked at a law firm, and is a lawyer by profession—but he shifted to teaching in the world of tourism. He said that after practicing as a lawyer for a good few years, it dawned on him that he’d like to change gears, but he won’t discard his legal profession, for he can always revert to it, anytime. What he’d like to do in the meantime is continue traveling and sharing his knowledge of travel and tourism to those who want to see the world. We dropped by Santa Catalina de Alejandria Church, and I asked God for His divine protection on my new friend Alvaro’s behalf. He was fascinated by the smell of the candles, thanking me for praying for him. I took him to Dumaguete Port again, after failing to catch the ferry en route to the island of Siquijor earlier, three hours ago. I thanked the security personnel for the tight measures at the gate (as well as the many policemen we passed by while strolling along Rizal Boulevard, for making us feel a strong sense of protection). “Thank you for everything, Ariel. I want to see you again. So that means we’ll see each other the next time I visit the Philippines. I don’t mind coming back again and again to such a beautiful country as this. Come on. Let me give you a hug,” he said good-bye. Attorney Alvaro Calderon said his Filipino friend back home in Spain had talked him into trying Chicken Joy at Jollibee. 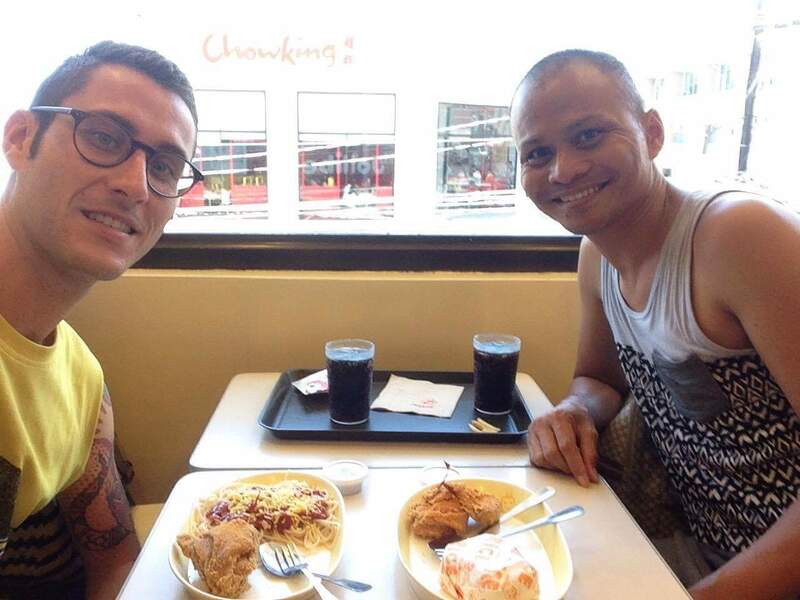 So here we are, on the second floor of Jollibee, but facing Chowking across the street. Next block is the Super Lee Plaza of Dumaguete City. 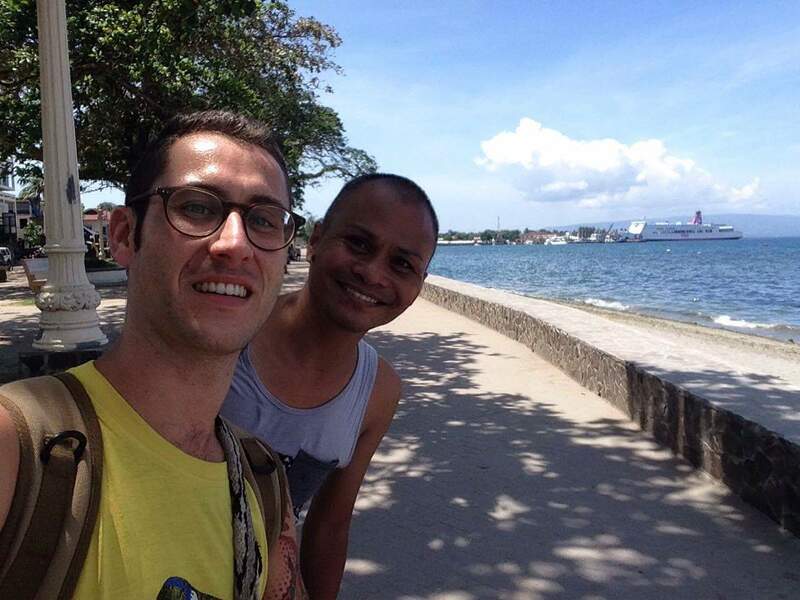 You can’t skip Rizal Boulevard when in Dumaguete. So we didn’t. ​”I like your teeth. I mean, I don’t want them. So don’t get me wrong. 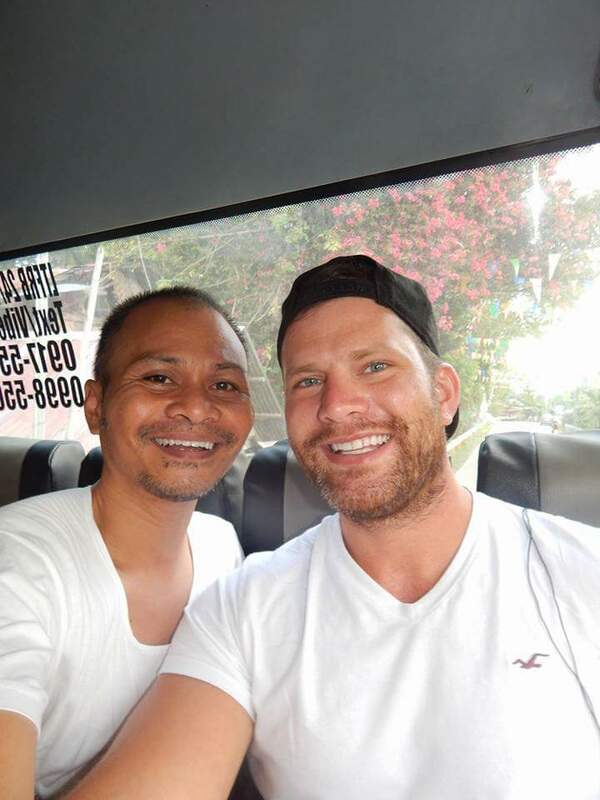 I just love your smile,” I broke the ice between me and this hot firefighter barely two minutes into our conversation aboard Ceres bus en route to Bato bus stop on Wednesday. That was the morning I was going to Dumaguete City and Valencia town in Negros Oriental, together with Savannah and Aunt Carmen, while he was bound for an exciting whale shark watching in Oslob, Cebu. His name is Billy Quayle. Yes, he works as a fireman in Canada, a country which grew on me and which I can confidently say I’m well-versed in, owing to my six years of being a financial service advisor for Canadian Chase card members before shifting to my current mind-boggling but exciting role as fraud analyst for US Chase cardholders. “Thank you, Billy. How kind of you to give me these, considering that you just met me and you hardly even know me,” I expressed gratitude. I’m confident that I have an impeccable set of teeth, thanks too to my dentists, Dr. Alma Albarillo and Dr. Rolex Omega, although at times one or two of them ache as much as my heart does. So I can’t discount the fact that such a kind gesture given by a stranger took my breath away, especially when my baby Savannah started throwing up beside me. On the spot, right alongside us, I gave Savannah a sort of real-time coaching on how to be confident in dealing with people—take note: not flirting—especially to reciprocate acts of kindness with words of thanks, which she said to Billy, whom she fondly referred to as Uncle Billy. In the course of our conversation, I couldn’t help feeling visited by those good old days where I was talking to Canadians over the phone. “Oh, no, Ariel. Don’t start crying. I’m running out of tissue paper now. That’s the last one I gave for Savannah,” Billy quipped. 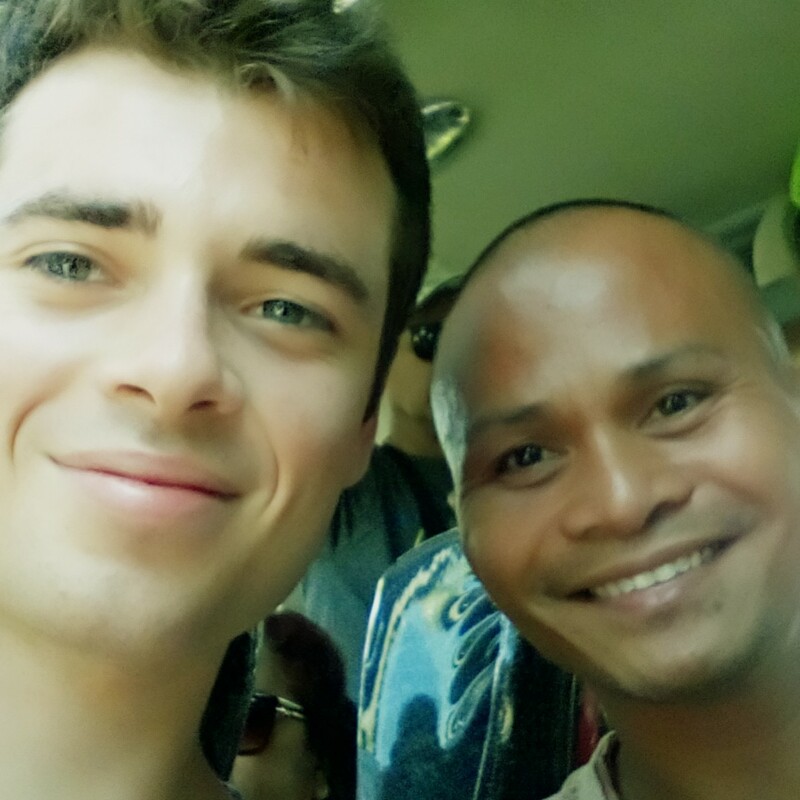 Billy Quayle, the hottest fireman in Canada, and this blogger, Ariel Allera, warming each other on Ceres Liner bus on the way from Moalboal and Malabuyoc, respectively, to Bato, Santander. ​If you’re a die-hard pageant devotee like me, it will take time for you to get over the Miss Universe fever, even long after its 65th pageant exactly one week ago in Manila, where a European bombshell named Iris Mittenaere from France walked away with the Miss Universe 2016 crown. 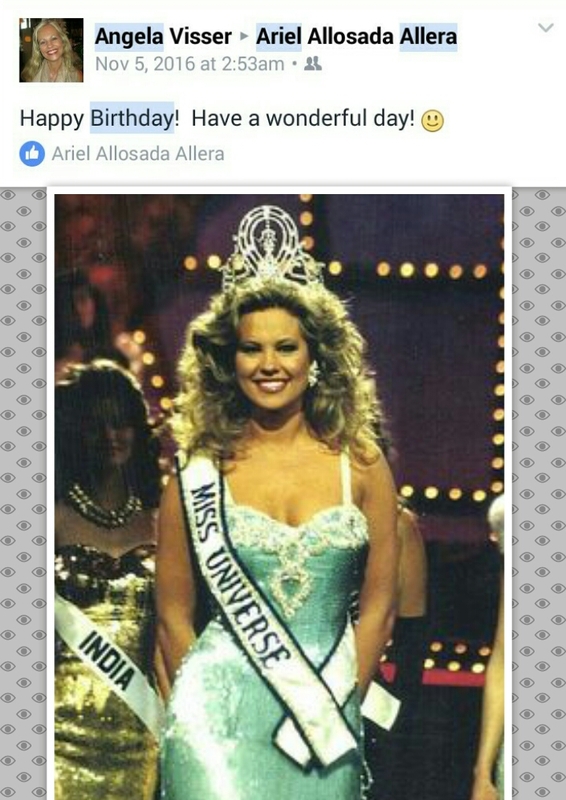 And, yes, I know: It’s been three months already since I celebrated my birthday on Nov. 4, 2016, but I can still remember how surprised I was: when I was going over all those birthday greetings from friends on my Facebook Timeline and, lo and behold, one of them actually came from Miss Universe 1989 Angela Visser from Holland. Don’t get me wrong: every greeting meant a lot to me, and I thank you again for those, but I would be a hypocrite if I didn’t admit to being especially happy that a Miss Universe took time to greet me on the most beautiful day of my life. 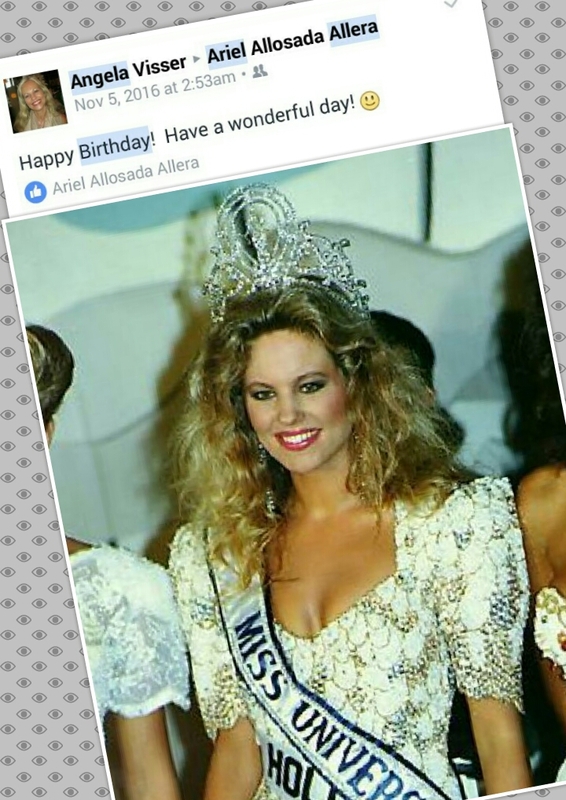 I thanked Angela via Facebook Messenger, and then we started exchanging messages as though I, too, is a former Miss Universe titleholder like herself. Our country has hosted the Miss Universe Pageant three times. The first time was in the seventies, in the year I was born, where the Spanish sweetheart named Amparo Munoz was crowned Miss Universe 1974. Twenty years later, India’s Sushmita Sen was crowned Miss Universe 1994 in Manila, where Angela Visser and Arthel Neville co-hosted with Bob Goen. Thank you very much for touching my heart on my birthday. Your beauty is a given, and to say that you’re a beautiful woman inside and out is oversimplification. You’re more than that. But I’ll definitely have to look for the lexicographer who can teach me the exact word to show the universe how you’ve made me feel more confidently beautiful since then. May I ask your permission for me to have your greetings laminated and framed and then mounted on the wall? 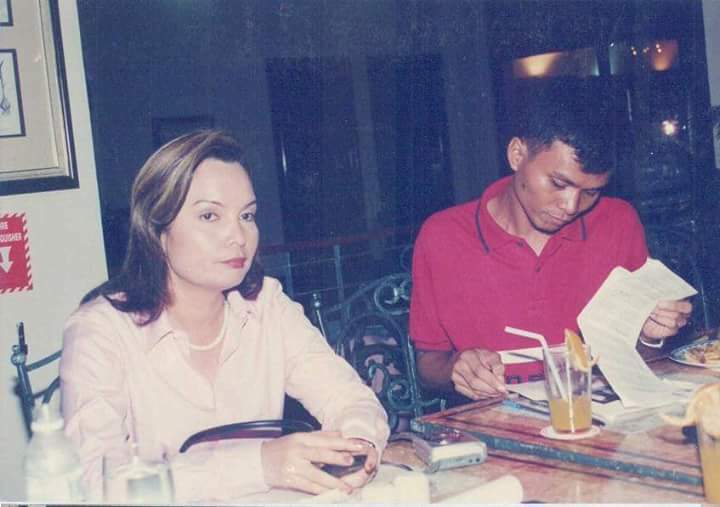 ​Now that a new queen named Iris Mittenaere from France has been crowned today as Miss Universe 2016 in Manila, let me flash on that one beautiful day eons ago where I had the privilege of interviewing the Miss Universe 1973 Margarita “Margie” Moran who bagged her crown in Athens, Greece, some forty-three years ago. She’s not the one and only international beauty queen I’ve had the opportunity of coming up close and personal with, but my one-on-one moment with our very own Miss Universe from the Philippines will always stand out. That’s because Margie Moran exuded a lot of grace evident in her tact and many fine characteristics specifically inherent to confidently beautiful queens like her. She was naturally courtly. And she was solicitous to a T that she let me be myself as a fan rather than as a writer assigned to interview her for The Freeman Newspaper’s Lifestyle section. ​I’ll be lying to you if I say I’m hardly crestfallen that I’m unable to watch the Miss Universe 2016 Pageant today in Manila. But the thought that I’m more than privileged to have met the man and woman running this most prestigious beauty event in the world assuages me in a way that, yes, I may not be there to witness the world’s most beautiful women gunning for the most exalted crown, but I have talked to and exchanged pleasantries with the Miss Universe Organization president Paula Shugart (center) and the vice president Shawn McClain (right). In the pageant world and possibly beyond, I have never met such a beautiful woman with an equally beautiful heart as the Miss Universe Organization president Paula Shugart. Who would’ve thought that two years after our first encounter, she would still remember me? During a segment break from last year’s Binibining Pilipinas Coronation Night, I was standing in the hallway to take a breather from long sitting inside Smart Araneta Coliseum when Paula Shugart walked in front of me. “I’m well. It’s good to see you again. How have you been?” Paula took my breath away, not only by making me feel remembered but also by really remembering me from two years ago. For a second, I was at a loss for words. Wouldn’t you be if you were in my shoes, when someone like Paula, who could’ve easily forgotten you amongst the more important people she may have encountered in all her travels and business transactions, treated you like a colleague, or as if you’re one of the past Miss Universe winners? “By the way, thank you for the token you gave me then. It’s in my office in New York. That’s very sweet of you,” Paula warmed the cockles of my heart, especially that I didn’t even have to remind her of it. Back in 2014, Paula Shugart was invited to grace the Binibining Pilipinas Coronation Night, with Miss Universe 2013 Gabriela Isler from Venezuela as one of the judges. “Oh, thank you very much. How sweet of you to think of doing that. I am very touched,” Paula said, something to that effect. O.K., then, I guess I’ll have to repost my blog on that first encounter of ours: to reminisce my first beautiful experience with this most beautiful boss in the universe. Behind the scene where all those beautiful women from more than eighty countries converge, flash their smiles, wave their flags, and vie for the one most coveted Miss Universe crown every year is the most handsome man whom I’d rather vie for had I been one of the contestants. This most desirable man I’m referring to is no less than the Miss Universe Organization Vice President for Business Development & Marketing, Shawn C. McClain. Although winning his heart is next to impossible, I consider having met Shawn McClain up close and personal as an added feather in my cap, especially that I’m both a buff of Miss Universe beauties and a bug of intellectual hotties. It was not a mere encounter I had with Mr. McClain in Manila summer of last year. I attended the Binibining Pilipinas 2016 Coronation Night where Maxine Medina was chosen to represent our country to today’s Miss Universe 2016 Pageant. It was epic in that it’s not every day that you can rub shoulders with a bigwig representing an organization that you’ve been following all your life. I remember it was during one of the segment breaks and I was in the lobby taking my personal break from all the uproar inside Smart Araneta Coliseum. I came across him and then introduced myself as a pageant blogger who flew all the way from Cebu to cover the country’s premier beauty pageant. And then he introduced himself too, adding that he was impressed with how passionate I was about pageants. We talked about the Philippines’s possible hosting of the Miss Universe 2016 Pageant, which is already happening today at the Mall of Asia Arena in Manila and which will be telecast by all TV stations. What struck me the most was that considering his position in this “most beautiful organization in the universe” called the Miss Universe Organization, not to mention his super good looks, he was genuinely kind, which goes to say that if only all good-looking men on earth were as kind as Shawn, this would be a more beautiful planet to live in. 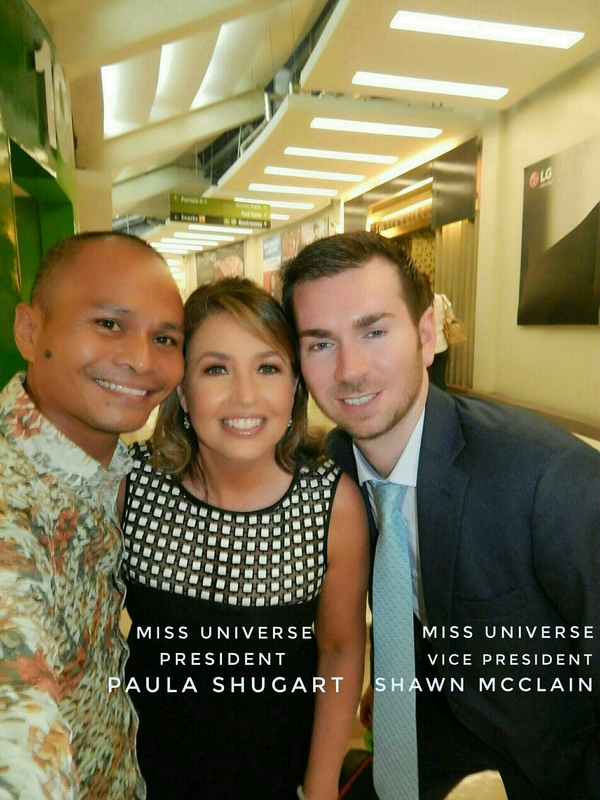 ​In the pageant world and possibly beyond, I have never met such a beautiful woman with an equally beautiful heart as the Miss Universe Organization president Paula Shugart. ​Behind the scene where all those beautiful women from more than eighty countries converge, flash their smiles, wave their flags, and vie for the one most coveted Miss Universe crown every year is the most handsome man whom I’d rather vie for had I been one of the contestants. It was not a mere encounter I had with Mr. McClain in Manila summer of last year. I attended the Binibining Pilipinas 2016 Coronation Night where Maxine Medina was chosen to represent our country to tomorrow’s Miss Universe 2016 Pageant. It was epic in that it’s not every day that you can rub shoulders with a bigwig representing an organization that you’ve been following all your life. I remember it was during one of the segment breaks and I was in the hallway taking my personal break from all the uproar inside Smart Araneta Coliseum. I came across him and then introduced myself as a pageant blogger who flew all the way from Cebu to cover the country’s premier beauty pageant. We talked about the Philippines’s possible hosting of the Miss Universe 2016 Pageant, which is already happening tomorrow morning at the Mall of Asia Arena in Manila and which will be telecast by all TV stations. ​Before I left for Cebu City this afternoon, I dropped by Malabuyoc People’s Palace to take a selfie or two. And only a couple of hours earlier, my cousin Alma Allera Pimentel and her hubby, James, dropped by my house to invite me into a free ride in their car as they’re heading to the city. “Thank you. But look, I’m not prepared. I haven’t even taken a bath. Nor have I packed my bags. I still have a lot of cleaning to do in the front yard. Plus, I prefer taking the bus for one reason you already know. But if I’m broke today, I will definitely have no choice. Thanks again,” I declined. I remember a conversation I had with a group of friends at the cafeteria in our office building. We talked about specific topics from finding old friends via social networking sites like Facebook to making new friends, preferably foreign, on various sites. They’re all comparing apps and whatnot. And because I wasn’t quite familiar with many, I couldn’t relate. “I’d like to download one of those apps, so I could start searching for new friends now. What’s the best one for me?” I asked. “Why? What’s wrong with me?” I expressed bewilderment. Right now, I’m on Ceres bus and, while writing this, I’m chatting with my seatmate from a neighboring town whose work is transporting bodies from the hospital to its morgue. How morbid! He’s cute, but I’m sure you will say that he will pale in comparison to all of the foreign travelers I’ve featured in my blogs. 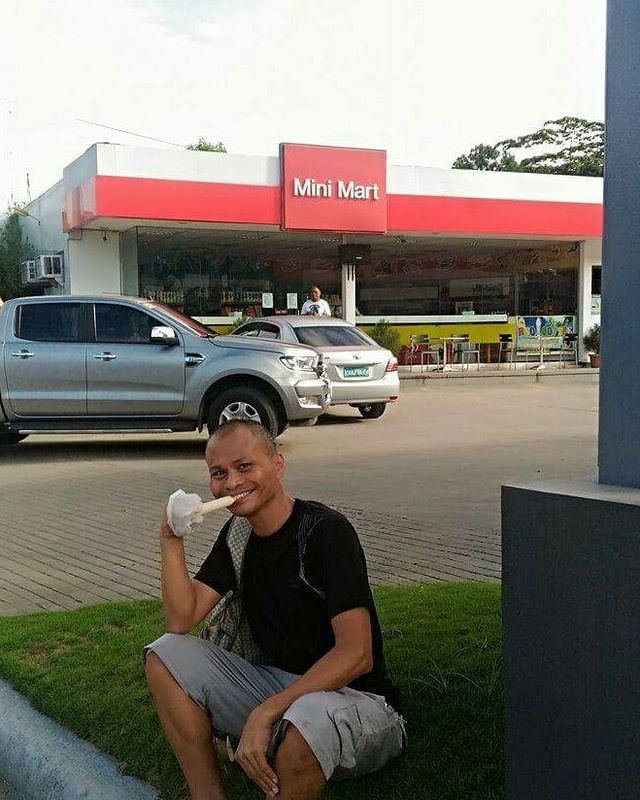 This blogger, Ariel Allera, takes a selfie while waiting for Ceres bus in front of Malabuyoc People’s Palace in Malabuyoc, Cebu.